Businesses, pressured to curb carbon emissions due to global warming concerns, are increasingly relying on tree planting as a cheap way to offset their carbon pollution. Now a pioneering California firm wants to expand the frontier of carbon offsets from terra firma to the open sea. Planktos Inc. launched their sea research vessel, the Planktos Weatherbird II, from Washington D.C. this past March. From there, it wound its way down toward a square patch of the southern Pacific, beginning a series of large-scale experiments in May. Within this patch, the company plans to carefully demonstrate the ocean’s potential as a carbon catch. Some experts are skeptical, but if Planktos is right, converting portions of the ocean into enormous “carbon sinks” could become a lucrative and environment-friendly enterprise. Using iron dust, the company intends to fertilize a 3,800-square-mile area of ocean that lies within boundaries marked by Baja Mexico, Hawaii, French Polynesia, and the Galapagos Islands. The deposition is intended to trigger a massive bloom of microscopic plants known as phytoplankton, which in turn absorb carbon through photosynthesis. With an amount of iron no larger than a hefty vitamin tablet, an Olympic-sized pool of seawater can be ‘seeded’ to grow these blooms. “There’s a huge potential there. It’s a potential that is associated with simply restoring the productivity of the open oceans to levels that it once enjoyed in the 1980’s,” says William Coleman, Planktos’ chief operating officer. Coleman claims that phytoplankton productivity has declined by as much as 14 percent over the last 20 years because of changes in ocean conditions. He says recent attempts at soil management, allowing lesser amounts of iron from the land to be wind-swept to the ocean, and higher carbon dioxide levels in the earth’s atmosphere, “turning oceans into a slightly acidic carbonated beverage,” have depleted phytoplankton. Coleman also listed warmer global temperatures as a contributor to phytoplankton decline, citing a recent NASA satellite image study. A crucial aspect of the company’s project is going to be demonstrating that a significant amount of atmospheric carbon consumed by managed plankton blooms will remain in the deep ocean rather than returning to the atmosphere. The more challenging — and crucial — portion of the experiment involves understanding what ultimately happens to the absorbed carbon. To find out, Planktos plans to deploy equipment that drifts with the blooms and tracks whether the phytoplankton tissue that holds carbon is consumed by organisms, ends up in the deep ocean, or goes back into the atmosphere. Much of the plankton’s carbon is expected to end up in the food chain, a destination the company views as another form of storage that will benefit from increased plankton. Further tracking the path of plankton’s carbon falls beyond the scope of the company’s ocean experiment. Planktos estimates that 25 percent of the carbon assimilated by phytoplankton from carbon dioxide in the air becomes locked up in the deep ocean once it dies and sinks below 1,600 feet. Considering this, along with the scale of the ocean and the larger quantity of plankton that occupied it 30 years ago, Coleman claims that restoring the sea to its original algae level could catch and hold about 50 percent of all of the carbon dioxide released every year by cars, power plants, and all other human-induced sources. Meskhidze and John Marra, a biological oceanographer at Columbia University’s Lamont-Doherty Earth Observatory, estimate that just five percent of the carbon assimilated by phytoplankton sinks into the deep ocean, and only one percent ends up buried in sediment, far less carbon sequestration than Coleman predicts. One of the reasons this occurs, explains Marra, is that in their slow descent to the deep, few phytoplankton actually reach the ocean floor after they die. “The phytoplankton isn’t going to just rocket down to the bottom, they’re not like little bullets or little pebbles,” says Marra, “They sink 50 to 100 meters per day and that’s generally slow enough that they can be eaten or attacked by bacteria.” As a result, the sequestered carbon is then re-released to the atmosphere. “[It] ends up as a sort of zero sum game,” says Marra. If the iron-seeding projects in May show the ocean can indeed stow away a large amount of carbon, Planktos anticipates moving from the demonstrations to selling carbon offsets from oceanic plankton restoration soon afterward. Carbon offsets are part of the carbon credit marketplace, which began after the 1997 Kyoto Protocol, a multinational environmental agreement aimed at reducing carbon dioxide emissions. Countries that sign onto the Kyoto pact — the United States is one of the few that hasn’t — can fine companies within their borders for not adhering to carbon limits. But there is an alternative allowed under the Kyoto agreement: companies releasing excessive amounts of carbon can avoid cutting their emissions or paying fines by agreeing to buy carbon credits from firms like Planktos. If Planktos can provide the federal Department of Energy with verifiable data showing a significant quantity of carbon sequestration at sea, they can add to the half-billion ton stockpile of carbon credits, which was attained mostly through tree-planting offset projects. They will also be able to undercut the going rate on carbon credits. Currently, voluntary carbon credits in the United States trade at up to five dollars per ton of carbon dioxide while credits recognized by the Kyoto protocol now fetch around 20 dollars per ton in the European Union, Japan, and Russia. Planktos expects the effectiveness and feasibility of their iron dust treatment will allow them to offer rates that go below the price of even voluntary credits. Coleman notes that Planktos is currently working with electric and petrochemical companies — both intense carbon emitters — in Europe and in parts of the United States where state governments are setting up credit-trading programs. “We’re active in all three fronts of business, policy, and science,” says Coleman. i’m sure that iron fertilisation would have the effect of reducing carbon dioxide levels , but , is it necessary to use just one mineral . surely a broad spectrum of organic and inorganic nutrients would have a more benificial effect . for instace if we were to stop catching fish or reduce catches it would be similar to applying a broad spectrum fertiliser . alternatively we could simply try spreading more of the nutrients we use on the land in the sea , ie. giving back what we take away from the seas . I think using phytoplankton as a carbon offset is a great idea. Form my limited knowledge on the carbon offsets I think that a phytoplankton carbon offset is the most efficient type of carbon offset. I would really like to see the option to purchase a phytoplankton offset whenever I pay for something that will produce a green house gas: air travel, gasoline purchase, payment of my electric bill and so on. I’m guessing that this phytoplankton offset would be very affordable. Also, I think before this happens we need to get a grasp on global dimming as explain in the next paragraph. Have you heard of global dimming? Just in case you haven’t it is the idea that the some pollutants are allowing less light into the earths atmosphere. Now we also have global warming, which is essentially that some pollutants make the earth hold in more heat. Recent research shows that global dimming may have prolonged our discover of global warming. Now, from what I understand most of the current approaches to combating global warming will actually mostly combat global dimming and therefor in the worst case could potentially make the earth heat up more quickly as in more heat would be allowed into the atmosphere and less heat would be allowed out. (Sorry for the above over simplifications global warming and global dimming) We need to find a way to combat global dimming and global warming equally at the same time. We also need more information and more accurate models. Global dimming is caused by polution particles in the atmosphere ( they can natural or manmade ) acting as nuclei around which water droplets form , which causes an increase in cloud cover leading more sunlight being reflected back out to space . This therefore has a cooling effect on the earth . Since developed countries have increasingly cleaned up their act in recent years it appears to have inreased the rate of warming ie. the cooling effect has been removed . The trouble is industrially developing counties are now pumping more dirt into the air . Typical deep-sea water masses have been isolated from the surface for long periods of time and have limited supplies of dissolved oxygen that are replenished at extremely slow rates. Multiple strata separate these deep waters from the surface waters and from the atmosphere, so that O2 equilibria in these deep water layers are (a) slow to replenish, and (b) likely to be highly-sensitive to disruption. Given what we already know about nutrient-induced eutrophication in aquatic systems and the catastrophic effects of the anoxia that results (classic textbook subject-matter), we should be quite skeptical of schemes that imagine wide-scale fertilization of the ocean’s surface layers. First, of course, on a century-to-century time scale, deep-sea organisms are adapted to one of the most stable, unchanging environments on earth. Secondly, while fertilization of the sea’s surface waters (with a dusting of iron, for example) may enhance phytoplankton growth, the increased biomass will not be confined to surface waters, but will result in export of tons of additional organics to the deep-water layers. Heterotrophic microbes in the deep-sea can be expected to respond to an increased import of such organics with a burst of exuberant growth – quickly depleting already limited supplies of dissolved oxygen, and producing a cataclysmic deep-sea anoxia. Since the ocean covers approximately 70% of earth’s surface, advocates of wide-scale fertilization, if successful in their campaign, may unwittingly trigger an ecosystem disruption and an extinction event on an unimagined scale. Even our brightest, most well-meaning, and most ingenious suggestions need to be measured against the human propensity to error, blunder, and trigger unintended consequences. Although we are an inventive species, we are also brash and display a reckless lack of humility. Current projects that envision re-engineering the operation of 70% of earth’s biosphere** constitute a clear example. Humanity’s central problems today are: (a) the impending arrival of a 7th, 8th, and 9th billion by mid-century, along with (b) the extreme levels of overpopulation / environmental impacts that we already exhibit. Yet, the biospheric and civilizational implications of these numbers are essentially absent. For instance, can biosystem functioning even survive a continuation of the impacts that we are already exerting today, even without the avalanche of new arrivals who are arriving at a rate of 800,000 additional persons every four days? 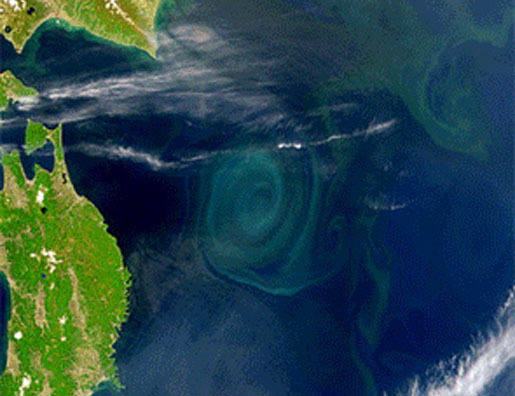 The economic premise of ocean-fertilization is that the phytoplankton would help combat or offset global warming by removing CO2 from the atmosphere – and private companies could then sell “carbon credits” to polluters for a profit by simply sailing out to sea and dusting the oceans with untold tons of powdered iron. While assorted policymakers (and industries) are attracted to such adventures, the passage above suggests that the results of any such large-scale projects could trigger a deep-sea extinction event of unimaginable proportions. NYU needs to re-think its apparent support of these particular schemes. It is true that every human activity can adversely affect our biological systems. We should spread awareness by creation of such topic. Thanks.